I’m waiting for fall and for fall things to do. And while I’m waiting, I’m looking for inspiration near and far. This is what came across my desk today. One. The lovely newsletter from Chic & Basta, the Canadian based company founded on the idea of supporting and promoting independent Quebec creators who produce handmade objects – beautiful, unique, and made to last. Owners Manon Martin and Louis Durocher, husband and wife, love the look and feel of perfectly imperfect objects. Me, too! I lingered over their curated collection of modern wood spoons, handmade by independent designers and artisans. Two. A long overdue visit to Mary Jo Hoffman’s blog, Still, to view her recent collection of photos against dark black backgrounds, night. And so it is that I came to pick up my camera and make a few simple still life images. I prefer simple, most always. 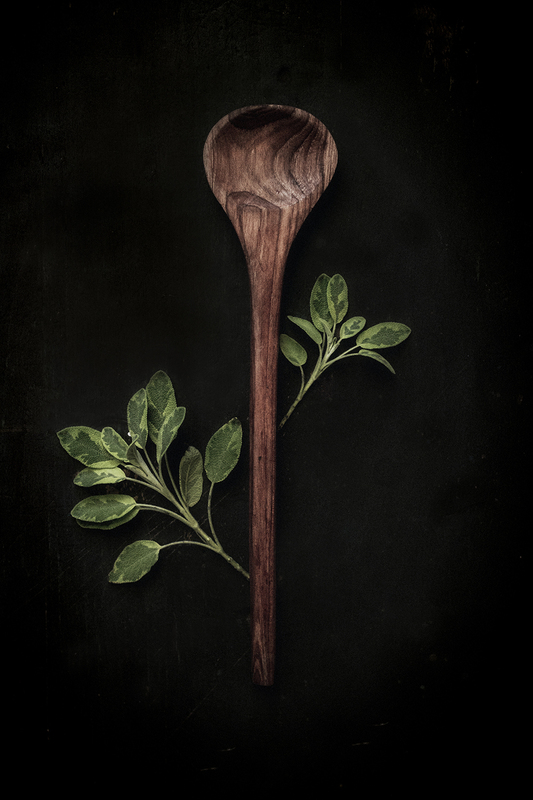 I began with my favorite hand-carved wooden spoon and the golden garden sage that is the last of the herbs still flourishing in the flower bed. The spoon, the springs of sage, against the dark wooden dough board. Snap, snap, snap. Rearrange sprigs of sage along the handle of the spoon so that spoon becomes flower and sprigs become leafy foliage. Snap, snap, snap.